It’s New Year’s Day. And it wouldn’t be New Year’s without black-eyed peas. Black-eyed peas aren’t peas at all but legumes, a member of the trusty bean family. 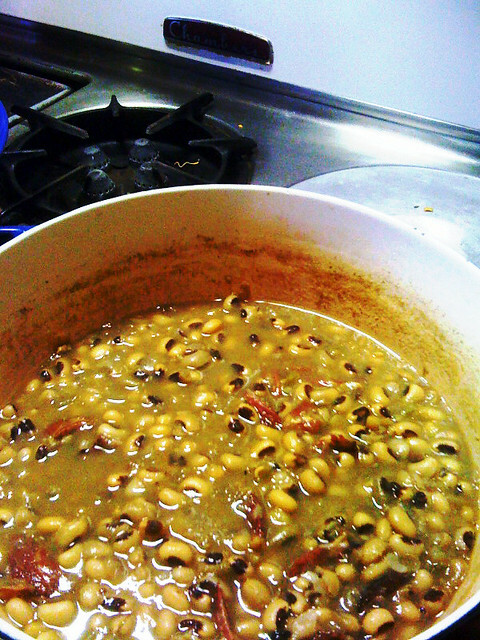 My family makes Traditional Black-eyed Peas every New Year’s Day for good luck. And black-eyed peas are also the prime ingredient in Hoppin’ John which spices up the peas with lots of onion, hot sauce, sometimes chili powder or jalapeno, and adds the rice right into the pot. Like its tasty counterpart, Southern grits smothered in butter and grated cheddar cheese, the reputation of the black-eyed pea seems to lie on the tongue of the beholder. Those who did not grow up eating black-eyed peas are prone to think they have an earthy taste (some might say like eating dirt!). But I love the taste of the funny looking bean, and the smell of a big old pot simmering on the kitchen stove takes me back to my grandmother’s kitchen. Black-eyed peas are related to the mung bean (according to the Library of Congress) and have been cultivated since prehistoric times in China and India. They were brought to the West Indies from West Africa by slaves around 1674. And the ancient Greeks and Romans preferred them to chickpeas. Black-eyed peas were considered field crops to the Northerners in the War Between The States and were often left behind in the fields. They became associated with being a humble food and fed many of the Confederate troops. Wherever the origins of the black-eyed pea, the Good Luck tradition has been carried down from generation to generation. The idea is that if you start out the New Year dining in humility, you will only become more prosperous as the year moves on. Some cook the peas up along with greens and cornbread. According to the myth of fortune, the peas represent coins, the greens symbolize paper money, and cornbread stands for gold. I imagine the sales of black-eyed peas skyrocket this time of year. A friend called last night to wish Liz and I a Happy New Year. When I told him I was cooking up a pot of black-eyed peas, he said, “Hey, did you add the penny to the pot?” “Penny? What penny?” Liz asked. It wasn’t part of the tradition in our family, but some would add a penny to the pot of black-eyed peas and the person who received the dished up coin would be showered with good fortune all year long. My mother makes the simple, traditional recipe. And that’s the one I’m including below. I talked to her on the phone yesterday and am dishing up all the little tidbits she mentioned. If you’d like to read more history and recipe variations for black-eyed peas, I’m including all the research links at the end of the post. I hope you’re warm and celebrating the New Year. It is a time of humble new beginnings, a chance to start over with a clean slate. May your New Year be prosperous and plenty. And full of rich family traditions. I doubled my recipe because I bought in bulk and had soaked way too many peas. (You should have heard Mom laughing!) The ham hock was from the Wedge Co-Op and ran about 1.46 lbs. In our family we serve the peas over white rice. Some people prefer brown. You can also spoon them over cornbread (and include the juice). Whatever you prefer to eat with your peas, you’ll need to include that item in your Shopping List. Sort out any pieces of grit, hard or misshapen peas, or anything that looks like it just doesn’t belong there! Bad peas usually float to the top. In the old days, peas from the field had to be sorted for worms and other field critters. This is less of a problem these days. Add the pork. In our family, this is a ham hock. But you can add fatback, a little bacon grease, or just bits of bacon. We use a ham hock because most of the flavor comes from the bone. Some families saw off pieces of bone from a cooked ham and use that in their black-eyed peas. My sister said she adds Goya ham-flavored concentrate to her black-eyed peas and ham hock to spice them up. It’s like a ham bouillon. She said to keep adding water to the peas if needed to avoid them turning to mush. She also follows the Northern New Year’s tradition of making a pork loin rolled in sage, rosemary, and parsley and adding sauerkraut. I guess she’ll have double good luck this year! Those peas look delicious, QM! I have some overrripe, halved avocados waiting for me in the fridge. It’s time to mash ’em in with some chili powder, salsa, and lemon juice for guac. Happy New Year, QM! Jim made our black-eyed peas last night. He said they’d be better today if they sat overnight, and from what I can tell, he was right. I cooked cornbread, and we’re set for an early New Year’s Day dinner. After that I’m taking a hot bath and resting. I’ve come down with a nasty cold. Ugh. Yum to earthy black eyed peas! I tried to follow a recipe when I did mine, and I’m just not that kind of a cook. I picked over and washed the beans, and let them stand in warm water for a few hours to soak off some of the husks. When the pot is bubbling, I add the rest of the coarse chopped onion, the ham bone from the Christmas ham, and the garlic cloves, whole. The blackeyed peas cook fast…much faster than other beans, like pintos… maybe took about 2 hours. I scoop out the bone, trim what bits are on it, chop them and add them back. The dog got to enjoy the bone when it cooled. And, yes, I took it away from him before he got to cracking it open! I let the pot simmer for a bit more, until I can’t stand waiting any more, then I ladle out a “test” bowl. Can’t be having a bad bunch of black eyeyd peas now. 🙂 Gotta “test”. We save some for New Years Day, but have not problem ‘testing’ them on New Years Eve! Have a fabulously earthy 2008, Red Ravine! We had our blackeyed peas, ham hock, collard greens, rice, and cornbread. I never give people food to our little dog Ringo, but today I gave him a tiny serving of it all (just to cover all bases). Needless to say, his first day in 2008 was a very happy one! So it seems we are all set for 2008…well maybe..
Wishing all of you peace and light in 2008! Hi Leslie, those blackeyed peas sound delicious.I’ve made them that way also. QM made the tradional ones, plain and simple. I like Hopping John blackeye peas too. I think she will make the next batch more like yours.,with a little spice. P.S.-MOM & I had a good chuckle over the amount of peas you had soaked, but they look delicious! And remember we also had them to celebrate her 70th birthday . Next year I plan to add them to our New Year celebration as well. At the open house I went to today, Black Eyed Peas were served, but more like a soup. She made corn bread. It was good. I made my own soup; was sure I had BE Peas, but turns out I had to “make do” with Cranberry Beans, the only legumes in my cupboard. I had a ham hock, and thought I needed something else. Looked first in the produce section, where all the veggies appeared to be suffering from major hangovers…never saw such limp, sorry looking things! Went to the frozen veggies and discovered bags of cut up turnips with their greens…Eureka! How Southern can you get? It made a very comforting food, even though I forgot about rice. But I wanted to make it Sunday, so it would be ready for the whole week. I’m a happy camper…Cal won their football game Sat. & USC whupped Illinois in the Rose Bowl! I love the long shots of parade & game in Pasadena, as then I get to see the mountains! It’s a darn good thing I found you guys to enlighten my West Coast ways. I didn’t have a clue about Black Eyed Peas for New Years! Heck, I had Chinese food! I don’t even know if I’ve ever had black eyed peas… Our New Years dinner was always pork and sauerkraut when I was a kid. It was supposed to bring good luck. Maybe it’s a Polish thing??? LOL. We too had blackeyed peas over rice with the traditional northern pork loin and sauerkraut. I had the ham bone from the Christmas ham in the freezer which I am saving for ham and bean soup. Instead I used a little liquid smoke which is a nice addition if you don’t eat meat or ham because it gives the smoky flavor you get from a good ham hock. I passed on the greens because I knew I would be the only one eating them but I can never pass on the blackeyed peas. I guess I will have lots of change and little folding money this year (just like last year). I sometimes add a red delicious apple to my sauerkraut if it is too sour to sweeten it up but this year we had to open another bag of kraut because cooking the pork and kraut all day in the crockpot while we geocached took too much of the “twang” out of the kraut. Here is wishing all the Redravine readers a happy and prosperous new year. Having lived in Georgia for so many years, Hoppin’ John is part of my tradition too. For an easy meal, I sometimes buy a can of black eyes peas and eat them with sauteed greens and hot sauce. I can’t imagine not liking blackeyed peas. Now, we need to have some banana pudding for dessert, and sweet tea with the meal, some corn bread,…. the list goes on. Nothing beats soul food. I think I’m going to get out my crock pot as soon as I leave this comment, QM. Just wondering, QM, if there will be an easy way to access all your Southern recipes once the posts get old–redRavine-wise. I’ve seen many recipes I want to try eventually, and hope to be able to get at them easily when I need to eat Rocks or Banana pudding. We have Hoppin’ John on several days during the year—it’s too good for just the first. And maybe we need the luck at other times too. I like to serve it with some grated smoked gouda. I loved the use of the mini-photo of the black-eyed pease as punctuation or ornamentation throughout this posting. Hi MOM! It all sounds delicious, doesn’t it? I gain a few pounds every time I visit here. I want to thank everyone for the New Year’s well-wishes and fruitful discussion on New Year’s cookin’ and black-eyed peas! It’s a rude awakening this morning as I had a dentist appointment and now only have a few minutes over lunch to comment. But I did want to take a few minutes to say it’s great to read the comments from all over the country (and beyond). I also want to respond to Sinclair’s question about where to find these kinds of posts in the future on red Ravine. We added a Family Recipes category not long ago. I was already thinking about it and then I think it was leslie that chimed in and said we should add that category (along with Life Letters which I’m still discussing with ybonesy). Anyway, Sinclair, if you go to our sidebar on the right, look under our Categories (which we title – WE WRITE ABOUT), and click on Family Recipes, you’ll find all the red Ravine recipes I’ve posted there. You can do the same for posts about Taos, Books, well, you name it. Hope that helps. I’m going to eat a little lunch and read a little more. Happy New Year’s week everyone! leslie, I like red Ravine Cooks! We must have been commenting at the exact same moment. Is there such a thing as OD’ing on black-eyed peas? My husband probably had about 12 bowls in 18 hours, and he woke up with a bit of a tummy problem this morning. gypsyheart, I’m glad Ringo got his taste of New Year’s luck! BTW, I like the quote at the top of your blog from Glenda, the good witch from The Wizard of Oz: You’ve always had the power, my dear. You’ve had it all along. Isn’t it the truth? leslie, your peas sound like they turned out great. So full of fire! I might add a little spice to mine next time, or try Hoppin’ John. From what I’ve read, everyone makes them their own way. That’s why I wanted to just give the basic, easy to do recipe. And find out what people are doing with it! LB, the pork and sauerkraut is the Northern New Year’s tradition (as alittlediddy writes about). It’s also great. But you’ve got to try the black-eyed peas sometime! diddy, the apples sound like a good addition. I’m glad you and Mom had a good laugh over all the extra peas I have around! 8) That reminds me, they are in the fridge and I need to do something with them. Black-eyed peas don’t keep long and start to get that real heavy earth smell if you don’t cook them up right away. R3, I’m glad you geocached on New Year’s. It was too dang cold here to even go out. And today when I woke up, it was -5 (-14 with the windchill). Greta and Sylvia started right up though. We’ve got some great vehicles. Oh, R3, thanks for bringing up the people that don’t eat meat or pork. There are lots of vegan recipes for black-eyed peas out there. You can spice it up your own way without the meat. And, as you say, the liquid smoke works, too! Marylin, so you had ham hock and cranberry beans for New Year’s? I don’t know if I’ve ever had cranberry beans. The turnip greens, yep, that’s pretty Southern. I also didn’t know you were a football fan (?) See, learn something new about someone everyday in this community! Elizabeth, thanks. ybonesy inspired me to begin experimenting with size in the images. She was the first to do it on red Ravine and has posted some creative combinations (mostly notably her own doodles). So I credit her with the beginnings of multifaceted images in my posts. ybonesy, I think it IS possible to OD on black-eyed peas! Liz and I each had a huge bowl and then skipped a day. Tonight, I think I’m going to cook up a batch of white rice and polish off the rest of the black-eyed peas and ham. I may have a little leftover for lunch tomorrow. I hope Jim’s stomach is okay! You know, Liz was kind of feeling the same way a few nights ago. But she was nowhere near Jim’s record of 12 bowls in 18 hours. Wow, that guy likes his beans! QM; I’m really only a football fan when the WEST is competing with a team from anywhere east of the Rockies, and always the Rose Bowl ! The Taurus/Gemini question is debatable, as in some astrological it may show Taurus ending on May 21, but most show it ending with May 20. My B’day is May 21, so I am right on the edge. I’ve always related more to the qualities of Gemini than Taurus. Put info on Heart Mt. Relocation Center in the mail for you this a.m., along with calendars I hope you can use. I think a posting or book of redRavine recipes would be super! Maybe you should have your astrological chart done. I’m a cusp person, too, between Cancer and Leo. But my full natal chart (with all the planets, sun, and moon) absolutely confirms all the Cancer (with Taurus rising, Taurus Moon). Not much Leo at all. And I’ve always identified with Cancers. I know a good, accurate astrologer here. She’s almost psychic. If you ever want to get your chart done when you visit, let me know! Thanks for sending the Heart Mountain Relocation info. The calendar, too. Looking forward to receiving them. And maybe visiting Heart Mountain when I make it out that way again. Hmmm. I might smell a future post coming on. Liz and I are just about to dig into more black-eyed peas, cornbread, and rice. We slow-cooked them last night and had them fresh at midnight. Liz added a few more spices to the mix and with the honey-baked ham and bone left over from Christmas, these are some of the best black-eyed peas I’ve had. I’ll come back to add the list of extra spices in a bit. Hmmm. So many great tips for cooking black-eyed peas in these comments. Everyone does them their own way and I find the recipe never comes out the same way twice. All those spices sound yummy, QM. We didn’t make our BEP nearly that spicy last year, and I think I would like them with a lot more oomph. Maybe next year. ybonesy, our black eyed peas weren’t as spicy as the above list leads you to believe. There was just a pinch of most of the hot stuff. I can’t really handle really spicy foods. It did make them much more flavorful though. Really good. I should note, too, that I was hesitant about the beans being old because black-eyed peas aren’t that common of a dish up here in the North. And we just had that fiasco with the old pinto beans we had never getting soft for our Frito Pie. The black eyed peas ended up being fresh though and softened up nicely. I did learn that old peas or beans will not soften, even after boiling them forever. Fresh is best! Your New Year’s dinner sounds great, ybonesy. I think all New Year’s Good Luck rituals work, no matter the food or ritual, because it’s setting the positive intention and breaking bread with loved ones that makes the effort pay off. Whatever our rituals, whatever our traditions, we are thinking positively ahead for the future. And that’s all that counts. 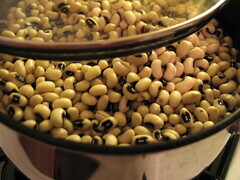 I’m going to a Winter Solstice gathering today, and am hoping someone will bring black-eyed peas for the new year. I’m bringing spinach casserole, a recipe I got when I was 19 and working at a dude ranch in Colorado. Oh, Teri, I wish someone would bring black-eyed peas to the Winter Solstice celebration, too! You know it would have been perfect but we’re bringing chili and fresh bread. I was just talking to some people at work about black-eyed peas at our potluck last Thursday. All the Northern born and bred people snubbed their noses at them. But the one other guy whose family came partly from the South was on board with me — you HAVE to have black-eyed peas for New Year’s! Traditional good luck. Maybe we’ll save you some this year. Did we ever share our black-eyed peas and ham with you? I can’t remember. I was introduced to black-eyed peas in Mississippi. I was a sophomore in college, down in Jackson working in an inner-city mission for a month. The people who ran the mission served them to us several times a week. All the food they ate was part of their social, global, be-aware-of-hunger-in-the-world message. I really loved them, and have continued to go in spurts where I eat them. I always associate them with Voice of Calvary Ministries in Jackson. Every time I open a bag. Remember, if you’re using fresh peas, put them in a pot to soak today! We’ve got our black-eyed peas soaking on the stove for tomorrow’s traditional New Year’s dish. We’re using the hamhock we had put away from the Christmas ham. Can’t wait to smell the yummy black-eyed peas wafting through the air tomorrow. Good reminder, QM. I’m going to head out and buy some fresh peas today, and a hamhock. I need hamhocks anyway for my beans. I have the butcher cut a big one into fourths, and then I freeze the other three for later. Our Southern black-eyed peas are almost done. I’m hoping for lots of luck coming our way in 2010. Bo just mentioned that she adds a little molasses to hers so I think we’re going to add a bit and let them cook a little longer. Then make the rice and cornbread. Still watching the New Year’s parade. I might add the molasses, too. I’m serving mine with baby back ribs and rice. I was thinking that a touch of sweet might be good with the ribs. Hey, QM, we should take photos of our black-eyed peas and upload to Twitter. I love the color of the juice. I added celery, onion, and garlic to mine, since I’m doing Hoppin’ John. ybonesy, we added similar ingredients. Ours turned out delicious! 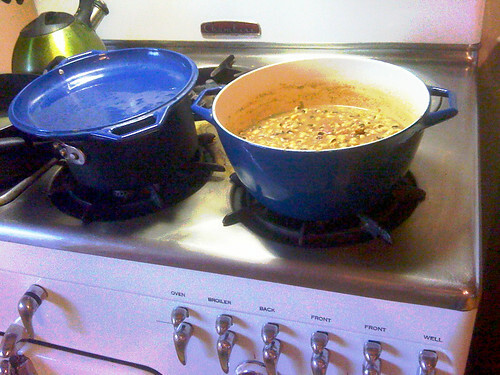 I added a photo to Flickr & Twitter — Simmering Black-Eyed Peas (LINK). Looking forward to yours. We ate a few bowls today using the same ingredients that I listed in the comment above from last year. Even the red pepper from New Mexico that Liz’s dad gave her. Can’t wait to have leftovers tomorrow. We didn’t have the cornbread today but are planning on making some tomorrow. We also added the celery and onion, no garlic. Hmmm. And, one final ingredient, courtesy of Bo — a tablespoon of molasses. Nice touch! Good idea to add the ingredients so you’ll know for next time. I added about a teaspoon of cayenne, a teaspoon of cumin, some “Soul Seasoning,” very little salt due to the ham, and pepper. Oh, and a shake of nutmeg. Didn’t add the molasses afterall, since it was so spicy. Wasn’t sure if the sweetness would be weird. We also cooked the peas with a sauteed onion and two stalks of celery chopped, and I braised the ham before adding it in. I liked it a lot. Very creamy juice, much like the juice of pinto beans when you cook it low for several hours. Thanks, QM, and thanks to MOM and all the others who’ve contributed to our knowledge of Black-eyed Peas. Without your love of this food and tradition, I never would have cooked them for my family. BTW, the nutmeg was a mistake. I added it, but I was actually looking for Allspice and got confused, adding the nutmeg instead. Wasn’t bad. Hmmm. Looking forward to a little New Year’s luck! Rereading last year’s recipe for the Black-Eyed Peas. Note To Self: Be sure to get a fresh package of black-eyed peas! Otherwise, they turn out old and chewy! Just put our in-bone brown sugar cured ham in the oven. It’s 9.2 lbs (the smallest we could get!) and will take at least 2 1/2 hours to bake. We’ll have ham for dinner tonight, then carve the rest up, take the ham hock and plop it into the crock pot to slow cook overnight with our black-eyed peas. I can’t wait. Bake ham according to directions. Spread glaze over ham approximately 20 to 30 minutes before ham is done, and continue baking. Garnish as desired. Just finished our black-eyed peas and ham. This year we made them overnight in the crock-pot. First time I’ve made them that way. We also made white rice to go with them. I like brown rice but with the black-eyed peas, white rice is best. At the last minute, Liz whipped up a batch of fresh mustard greens. We had used the same recipe for Thanksgiving, but with collard greens. The mustard greens are HOT! I guess that’s where they got their name. Liz forgot to put the vinegar in at first; you should have seen her face when she tasted how bitter they were! Fresh greens are so good, and good for you. I forget about making them in the day to day. Only seem to remember them on special Holidays. Happy New Year! I just came across this site today and what a wonderful home friendly site it is too! So much warm wisdom and friendly advice. Happy New Year to all of you! Peace and God bless. Just spiced up the black-eyed peas with ingredients in the comments above (LINK). Good luck cooks on the stove top. Happy New Year 2012! I can’t wait to eat good luck tomorrow. Hello, 2013! Our black-eyed peas and rice were delicious this year! Liz added three kinds of peppers. They had such a good flavor. Hope the New Year is starting out to be everything you wish. Can not believe another year has rolled by. Happy 2013! Who would have thought a woman from North Dakota would make the best black-eyed peas in the world. Today Liz repeated a version of the batch we made in 2010 (ingredients in one of the comments above). When we sat down to eat dinner tonight, she said, “It’s gonna be a fantastic 2014 because these black-eyed peas and rice are out of this world.” And so they were. And so it will be. Happy New Year everyone! Just getting the black-eyed peas on. This year we are trying a mixture from Bob’s Red Mill, a gift from Liz’s mom. Happy New Year 2015!